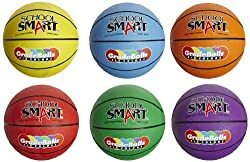 School Smart junior basketball set is used for gym or classroom activities, and has six balls in assorted colors--yellow, red, blue, green, orange, and violet--for ease of assigning and tracking ball ownership by class or grade. 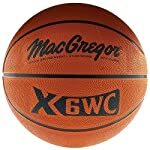 The balls are made of rubber for durability, and constructed to standard specifications for basketballs. Rubber is an elastic hydrocarbon polymer, and is highly elastic, resisting abrasion and impact forces. 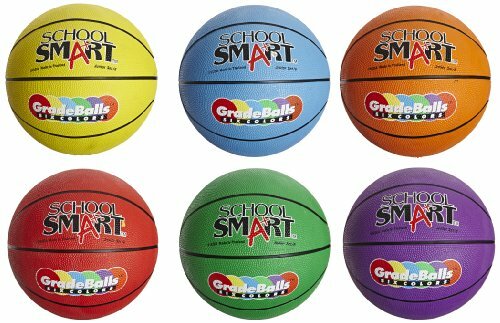 The balls measure 27.0 inches in circumference, and are suitable for middle school grade level.